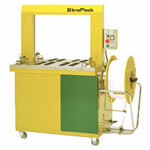 The Strapack RQ-8A strapping machine is designed for high output operations with a high level of automation. 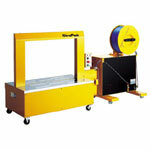 The plastic strapping automatically feeds through the arch for high speed operations. The RQ-8A carries a standard power supply of 220V Three Phase with an optional 110V Single Phase. There are many different arch sizes to fit a wide array of products and applications. 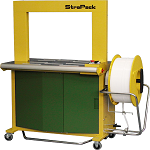 The Strapack RQ-8A strapping machine differs from the RQ-8 in that it has a conveyor top for the automatic movement of product through the arch. The RQ8-A has the ability to automatically triggered for operator free use. Boatman Marking is a full line Strapack Dealer and offers a wide array of strapping machines.